Officers reportedly shot an assault suspect who hindered EMS access to his victim in Minneapolis on Sunday, but many locals are unhappy with the force's version of events. The man was handcuffed at the time he was fired upon, according to eyewitnesses, though police chief Janeé Harteau said Sunday afternoon that the man was not handcuffed when police shot him. 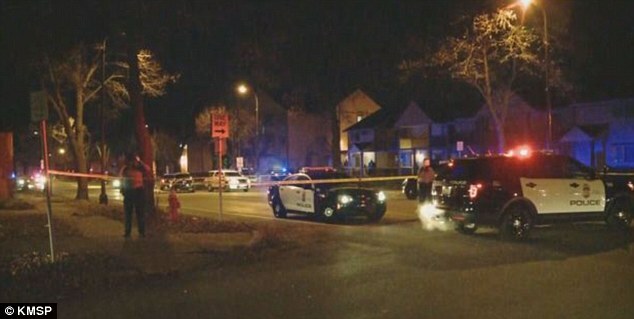 The Minneapolis NAACP identified the man as Jamar Clark, whose medical condition is unclear. The confrontation began about 12:45 a.m. in the 1600 block of Plymouth Avenue N., according to police. Authorities have yet to reveal the identities of the people involved or elaborate on the exact circumstances leading up to the assault. Nekelia Sharp, who lives across the street, said an ambulance was called after the suspect and his girlfriend got into an argument. While paramedics were taking the girlfriend away, the suspect tried to talk to her. Sharp said that’s when he was handcuffed and then shot. Bystanders swarmed as emergency vehicles were responding. In a video posted on Facebook by a witness, one woman was repeatedly shouting, “Y’all just killed that man!” Others nearby were pointing at police and taunting them. A protest formed and marched on the police station, writes The Associated Press. Jason Sole, chair of the Minneapolis NAACP's criminal justice committee, said many black residents of north Minneapolis are upset. "We have been saying for a significant amount of time that Minneapolis is one bullet away from Ferguson," he said referring to the shooting by a police officer in Ferguson, Missouri last year of black 18-year-old Michael Brown, which sparked nationwide protests. "That bullet was fired last night. We want justice immediately," Sole told Minnesota Public Radio News.